If you wonder why you have never seen a bobcat in Wisconsin, you can look directly at Wisconsin’s DNR and Legislature and their policies, including hiding for decades the annual April election for the Wisconsin Conservation Congress. The DNR and WCC have become even more irrelevant and killing-obsessed during our current mass extinction crisis. Trappers and their supporters dominate this sham election. You can also look at public apathy concerning the plight of wildlife mass murdered for fun by the small percentage of people who are entitled to kill daily for many months of the year. And you can place that within the destruction of two-thirds of wildlife across the planet in the last 50 years. Each animal was an individual life that revealed the richness of biodiversity of planet earth, just like your beloved cat or dog. One night a year where citizens could make a difference, and the vast majority of people who show up are trappers. Four to one across the state, those attending voted to expand trapping in former wildlife refuges, set traps within 15 foot of a beaver lodge, and trap raccoons out of season. You can see the statewide results here. Trappers are 0.003 percent of Wisconsin citizens, yet supporters of trapping comprise four out of five who attend, vote, and elect representatives to the WCC. A mere 0.001 percent of Wisconsin citizens attend. Even in Dane County, activist trappers and hunters again won the two seats available to the WCC in the April 9 election. Since I returned to Wisconsin in 1993, every governor, Republican or Democrat, has appointed a secretary of the DNR who was friendly to hunters. “Anti?” So caring about humane treatment of our wildlife in politically “progressive” Dane County had become “anti?” What was this? I have never missed an election and vote since that night. Politics are where decisions are made. Audubon told me they pick their battles. Apparently so does the Sierra Club, and encouraging their members to run as humane candidates for the WCC isn’t on their agenda. Should electing delegates protective of ducks, pheasants, sandhill cranes, crows, and mourning doves be one of Audubon’s battles? Audubon’s 20,459 Wisconsin members could have voted against the use of neonicotinoids on crops that poison birds. Their membership is three times the statewide attendance at the election this year. They, alone, could elect humane delegates. The Nature “Conservancy” with its 20,000 members allows hunting and trapping on 98 percent of their purchased lands. Would their votes in the WCC elections hurt or help wildlife? The League of Conservation Voters’ lobby days prominently feature trappers displaying furs. The first year I attended, the LCV promoted a Hunters’ Bill of Rights and a banquet of edible native wildlife. How would their members vote at the WCC elections? There are many other groups that, if they participated, could democratize the WCC hearing’s agenda and election: UW-Madison’s Nelson Institute, Midwest Environmental Advocates, 1000 Friends of Wisconsin, Natural Resources Foundation, WISPIRG, Wisconsin Wetlands Association, and Sustain Dane. Like the Aldo Leopold Foundation, most environmental organizations almost surgically exclude wildlife — and focus on land, air and water. Although these organizations do good work on the environment, saving habitat that will be used for killing is destroying our wildlife. Will they wait to include wildlife, holistically, until only 10 percent of earth’s wildlife survive in a total ecosystem collapse? Membership money talks and many of these older organizations kowtow to heavy hunter membership. Viewing the Nelson Institute speakers for Earth Day, Monday, April 23, it is stunning. There is zero mention of mass extinction in the entire line-up. • Another is Marcy West, executive director of Kickapoo Valley Reserve in southwest Wisconsin, which is a publicly protected 8,600-acre reserve that attracts low-impact recreation enthusiasts. Wildlife lovers can help create a Wisconsin bear sanctuary and education center 35 miles north of Madison by going to the Wisconsin Wildlife Ethic website, where there is more information on how to help. Take a stand against trapping on national wildlife refuges. • Should the trophy hunting of bears and wolves be banned? 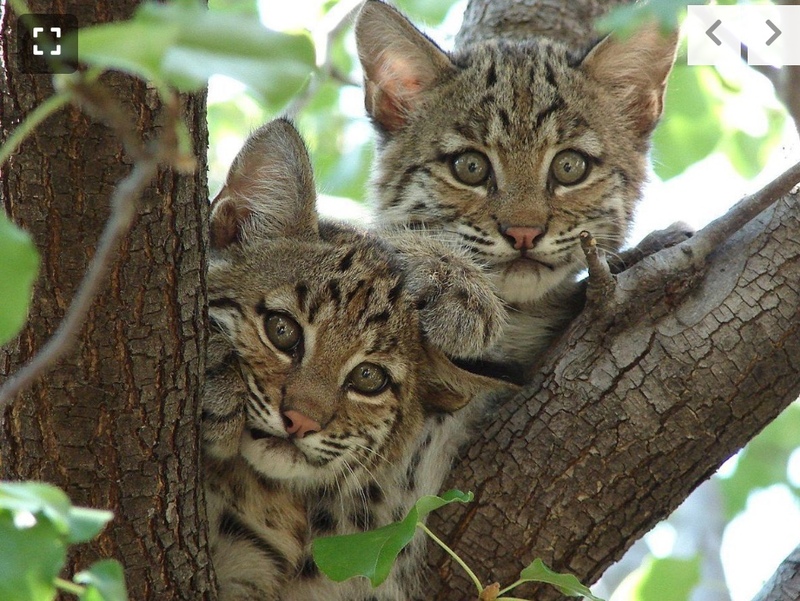 • Should bobcats be kept on the endangered species list in Indiana? • Should the clothing industry be fur-free? • Should we give up half of the earth to wildlife? Column originally published in the Madison CapTimes on April 22, 2018.